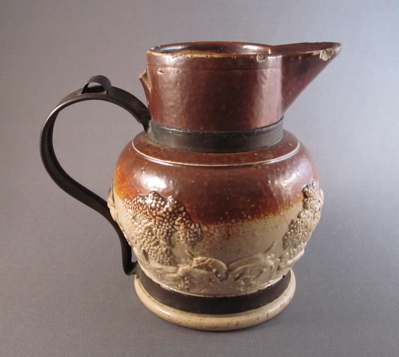 English salt-glaze stoneware cream jug with sprigged decoration entitled “The Kill”, made in the mid-1800’s, possibly in Derbyshire. 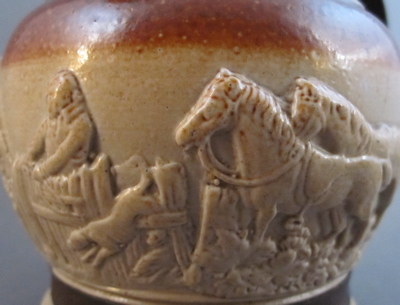 The glass-like coating is achieved by adding salt to the kiln and firing at approx 1660 degrees F (780 degrees C). 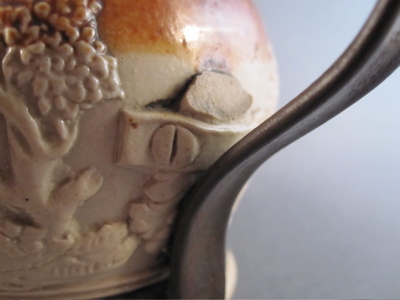 As the sodium chloride vaporizes and bonds with the silica in the clay, it creates a silicate glass “salt-glaze” finish. 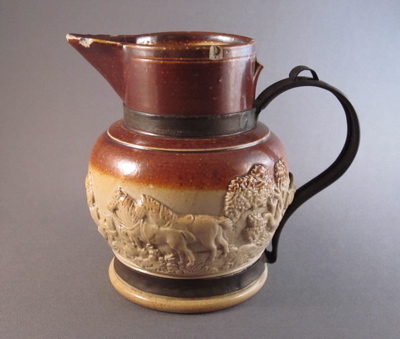 Jug stands 4-1/2″ high and is 5″ wide. Over 150 years ago, a tinsmith repaired the broken handle with a metal replacement, complete with thumb rest and straps. 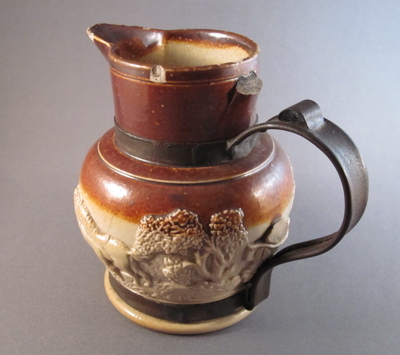 A screw and metal strap, part of the molded sprigged decoration, “held” the original ceramic handle in place, and now an actual metal handle has replaced the broken handle. 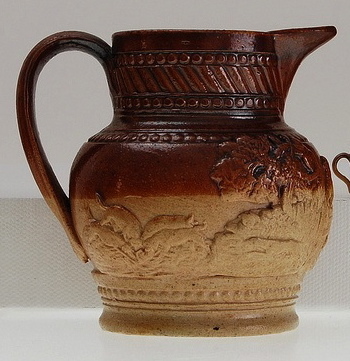 This jug, similar in form and decoration, still has its original handle intact. What a mess this guy is! It looks like someone threw it out of a moving car. 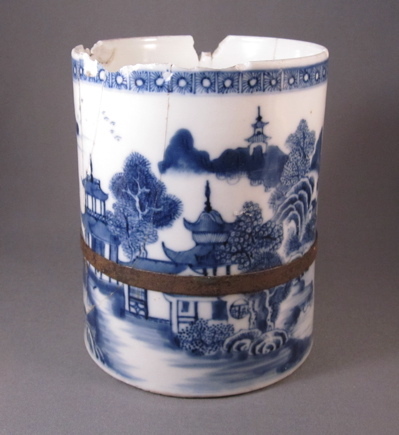 This humble porcelain mug with cobalt blue Nanking underglaze decoration began its life in pristine condition over 220 years ago in China and was most likely exported to North America or Europe. 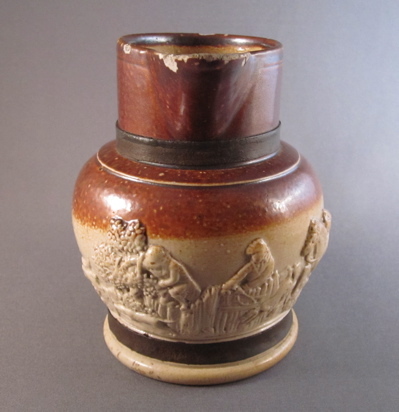 Measures 5″ high with a 3-3/4″ diameter. 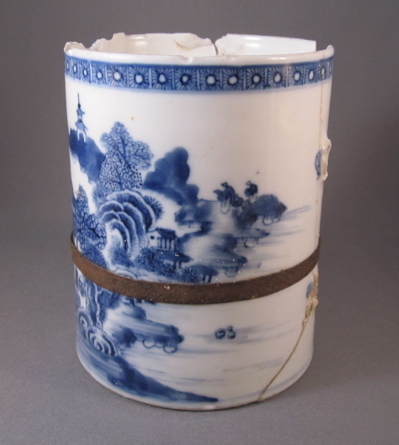 The original porcelain handle seems to have gone missing some time ago. 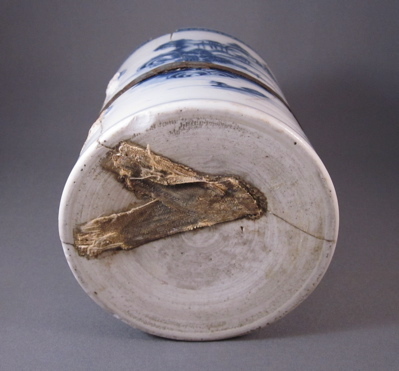 The rim appears to have been nibbled at by a porcelain mouse. 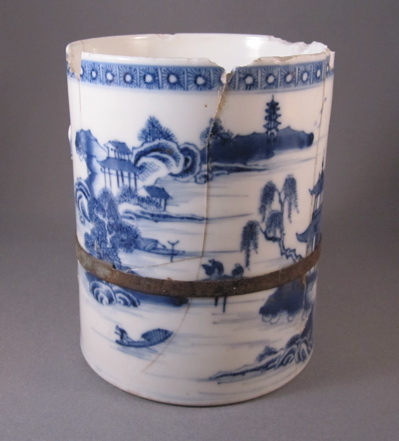 Although this mug is riddled with numerous cracks and chips, it will make a splendid pencil holder. 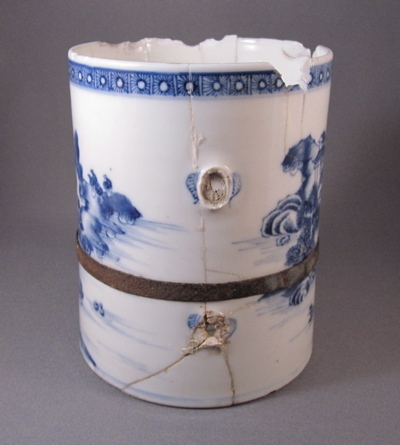 All that holds the mug together now is a single tin strap, added by a tinsmith in the 19th century. 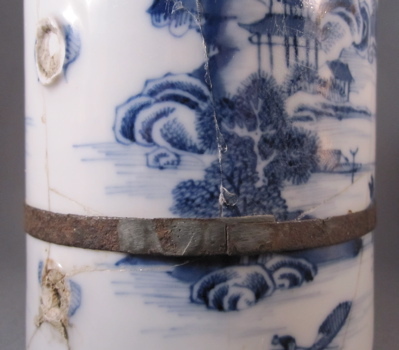 Bits of old fabric strips once sealed the cracks on the bottom. Looks to me like the linen used to wrap mummies. 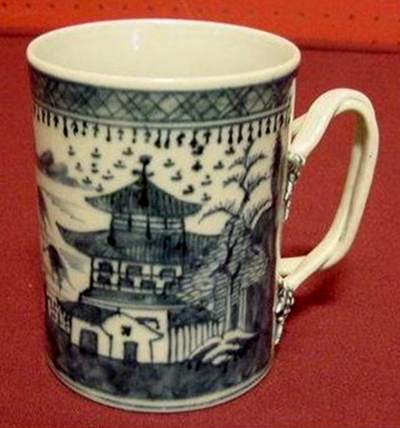 This mug, clearly in much better condition than mine, still maintains its original handle. But I am sure my mug had a much more colorful life.